For our third batch of yogurt, I decided to concentrate on the ingredients and buy the best whole milk I could find, which came from Ronny Brook Farm in a lovely glass bottle. 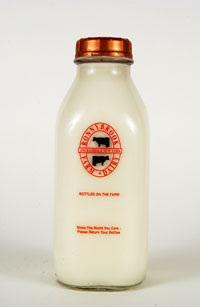 Holding the bottle had me waxing nostalgic about the milk of my childhood. Not that I remember much about its flavor. It is the delivery which remains etched in my memory. We used to keep a silver milkbox out front, where we would put out the old bottles and receive new. The milkman delivered twice weekly and my mother never had to worry about running out of milk. Too bad there's no milkman around here. But I digress from my mission.. Back to the yogurt at hand. 2. Heat to 170 f.
3. Let cool to 108-112 f.
5. Pour into glass yogurt jars. 6. Heat according to yogurt machine instructions (about 8 hours). 7. Cover, chill and eat. Izzy was as eager as ever to try our third batch of yogurt this morning. He opened the jar and wouldn't let me near it. Apparently it was "Too yummy to share." When I opened my own jar I was bowled over by the utter creaminess of our concoction. It was definitely our best attempt yet, decidedly rich and mild in flavor, without the tart aftertaste of our past experiences. thanks for sharing, I am looking to improve on mine which has a bit of a bite. I use 1% and everyone tells me I should be using 2%. I will go to the store and check out your recipe. hmm you add yogurt before you heat it, what is that for? Chris: I added the non-fat dry milk before heating. That seems to cut the tartness. I have seen it recommended in various recipes although it is not necessary. If you tried without you should definitely try with to compare. Organic Valley makes one.